If you’re looking for a unique gift for someone special this Christmas, take a look at some unusual offers from Sylva Foundation. 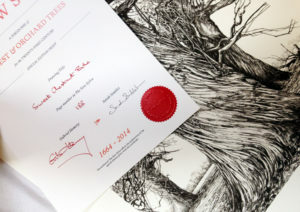 Read on to find out about our unique range of courses, an award-winning tree book available signed by the author, and some very special single-edition prints from the book. 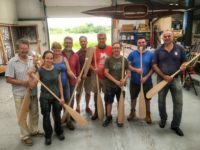 Choose from Canoe paddle making, Green wood stool making, Guitar maintenance & repair, Pole lathe working, Saxon building woodwork, Treewrighting and Timber-framing, and Hurdle-Making. 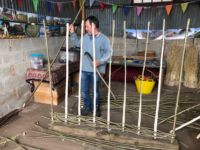 Courses will be supported by our brand new Teaching Barn, and overseen by our newly-appointed Head of Wood School. 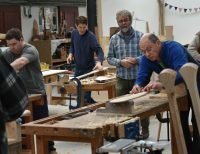 Via our shop you can also purchase gift vouchers for courses which offer a substantial discount to someone special to use when they book their own course of choice. 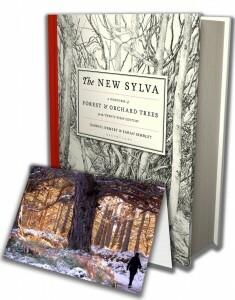 The New Sylva: a discourse of forest and orchard trees for the twenty-first century is a detailed and sumptuous celebration of trees and forests, by authors Gabriel Hemery (our Chief Executive) and Sarah Simblet (former Sylva Artist in Residence). Published by Bloomsbury in 2014, its 400 pages feature more than 100 tree species, accompanied by 200 specially commissioned pen and ink drawings. Books of the Year, 2014. Mail on Sunday. Winner, Trade Illustrated, British Book Design and Production Awards, 2014. Premier Award, International Society of Typographic Designers. All proceeds of sales via our online shop directly support our charitable work. Copies are signed by Gabriel Hemery, and a personal dedication can be added on request. The New Sylva by Gabriel Hemery and Sarah Simblet – published to wide acclaim by Bloomsbury in 2014 – contains 200 stunning pen and ink drawings, including whole-tree portraits, botanical parts and forest scenes. 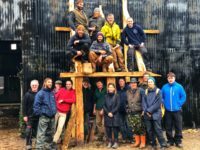 They were drawn by internationally-renowned artist Sarah Simblet while she was artist-in-residence for environmental charity the Sylva Foundation. Just 14 remain available for sale. Sarah Simblet rarely sells her work as prints. This represents a unique investment and a special opportunity for fans of her stunning drawings. Each print is signed by Sarah Simblet, and accompanied by an attractive Certificate of Authenticity, signed by both authors of The New Sylva. Visit our online shop to see the available prints. 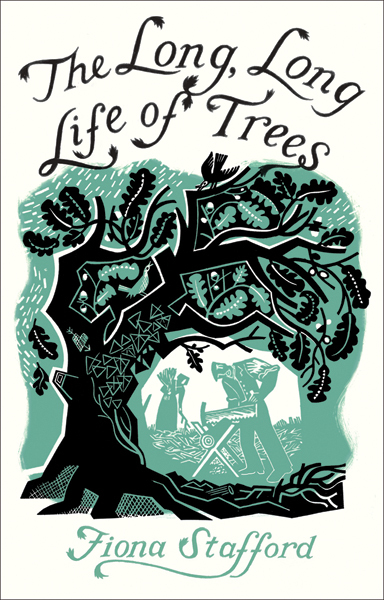 Fiona Stafford’s enchanting book The Long, Long Life of Trees includes intimate, detailed explorations of seventeen common trees, from ash and apple to oak, cypress, and willow. Full of unusual topics and intriguing facts, this book celebrates trees and their long, long lives as our inspiring natural companions. 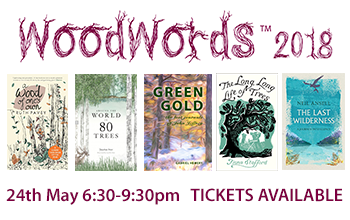 Dr Fiona Stafford is one of five top environmental authors talking about their books at our unique WoodWords 2018 event. Fiona was also the author of the Tree Charter in 2017, which Sylva Foundation was proud to support (read more). Tickets limited and selling fast – buy yours now! By popular demand we are extending our seasonal special offer of a free pack of 5 cards with every copy of The New Sylva ordered. Until 17th December we are offering a free pack of five cards with every signed copy of The New Sylva ordered from our online shop. Deadline for UK delivery in time for Christmas: Wednesday 17th December 17:00 GMT. All book orders placed between now and 17th December will qualify for a free pack of five greeting cards featuring the stunning Caledonian pinewood at the Black Wood of Rannoch. The wintery scene is especially suited for Christmas, while the card is blank inside making it usable all year round. The card will have special resonance for fans of the book. The figure in the photograph featured on the card is artist Sarah Simblet, and the image taken by Gabriel Hemery while the pair visited the forest while working on the book. Sarah’s resulting treescape featuring a ‘granny’ pine and surrounding forest fills a double page spread on pages 68-69. We are the only retailer offering copies of The New Sylva signed by both authors, Gabriel Hemery and Sarah Simblet. All sales proceeds go to our charitable work. Supplies are limited so please order early to avoid disappointment. Offer details: The extended offer closes on 17th December 2014. Five cards will be provided for every book ordered. Offer applies to purchases made only through the Sylva Foundation online shop. A very special limited first edition of The New Sylva is being considered by Bloomsbury Publishing, and all profits from its sale will go to the Sylva Foundation. The limited edition will interest bibliophiles, book collectors, fans of artist Sarah Simblet, and anyone with a special interest in trees and forests. 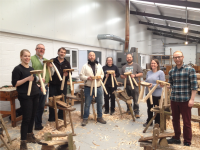 Not only could you make a wise investment, or endow a fantastic gift to a special friend, but your purchase will help support Britain’s trees and forests as all profits from its sale will go to tree and forestry charity the Sylva Foundation. Details of the special edition, in terms of the contents and price, will be announced soon. It is likely that the special edition would be sold exclusively by the Sylva Foundation via our online shop. The authors, via their blog at www.newsylva.com, are providing a unique opportunity for all readers to sign up to receive advanced notice of its release. If you are interested in receiving advanced notice, you can use their form below to sign up. Please note that by using this form you will share your email with the authors only. It will not be shared with the Sylva Foundation. 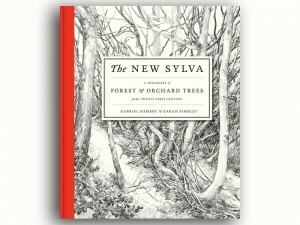 The New Sylva book, sponsored by the Sylva Foundation and to be published by Bloomsbury Publishing, has been listed. Earlier this week the cover design was revealed on the author’s blog (read more). The book now appears on various online bookstores from Amazon to Waterstones, and in Goodreads. The New Sylva will be launched on April 10th 2014 to mark the 350th anniversary of John Evelyn’s 1664 Sylva. Both authors will be speaking at our event in Oxford on 30th November – read more – spaces are still available. The New Sylva book, due for release in April 2014, is nearing completion. According to authors Gabriel Hemery and Sarah Simblet, writing in their blog this week, copy-editing is now complete and they are working hard to meeting the printing deadline of the end of November. The New Sylva is sponsored by the Sylva Foundation. 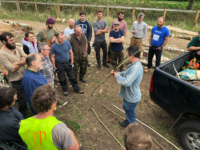 We have donated a future copy of the book to our friends at Small Woods as a prize for anyone entering their online survey: read more. Copyright © Sylva Foundation. All rights reserved.